Update: On Tuesday, June 17, 2014, the U.S. announced it had captured Ahmed Abu Khattalah and was transporting him back to the U.S. In October 2012, CBS News correspondent Elizabeth Palmer sat down for an interview with the suspect in the Benghazi attack, during which he essentially dared Libyan authorities to arrest him. BENGHAZI - Ahmed Khattalah didn't look like a wanted man, sipping mango juice across the table from me in a Benghazi hotel. Dressed in a crisp white robe, a long grey beard on his face, Khattalah was happy to share his fundamentalist Islamic beliefs. He calmly denied having anything to do with the Sept. 11 attack on the U.S. compound which killed Ambassador Christopher Stevens and three other Americans. "But the president himself, Mohammed Magariaf, told us you were one of the prime suspects," I told him. "If that's what the president is saying," replied Khattalah, "Then he should come to my house and arrest me." But that's something government security forces dare not do. What's behind the anti-U.S. protests in Muslim world? Khattalah is the chief of a ferocious militia in Benghazi, the Abu Ubaidah Brigades - a sub-group of the larger Ansar al Shariah militia. These men, armed to the teeth with weapons looted from deposed dictator Muammar Qaddafi's arsenals, act as both military and police in parts of Benghazi. They are the law - because they say so. The government's security forces - official police and army - are simply too weak to push them out. Khattalah told us he did go to the U.S. Consulate compound the night of deadly attack. "I went to help four men who were trapped inside," he said. When he arrived, though, the men were gone. "What time was that?" I asked. He couldn't remember. The shooting had stopped at that point, he said. Pressed on the matter, Khattalah said the U.S. deaths were a tragedy, but claimed they were due to a lack of understanding between the U.S. and Libya over the crude film mocking Islam's Prophet Mohammed. The attackers, he said, were just ordinary people. "Ordinary people armed with rocket propelled grenades?" The details of what exactly happened the night the consulate compound was attacked are still murky. 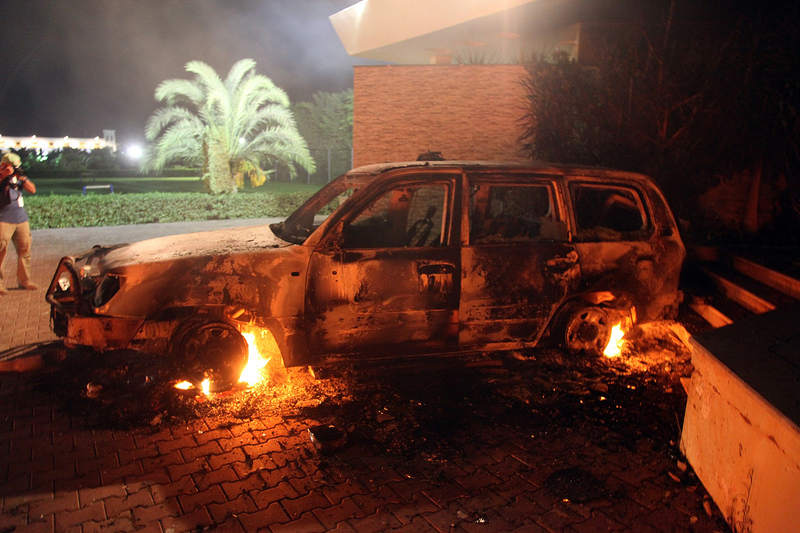 What is clear, though, is that Libya's government is paralyzed. Even though the official security forces are under huge pressure from America to arrest those who planned and carried out the attack, they haven't acted because any moves against the Islamist militias could turn into a bloody battle... one the government could well lose. If the government moves in to arrest some of the Islamist militia members suspected of the attack, I asked Khattalah, would it start a fight? "Yes," he answered. "That's what we expect."